The Death Rituals practised by the Ancient Egyptians included embalming and mummification (which are detailed on other pages). After 70 days, following the death of a person, an elaborate funeral procession headed towards the designated tomb of the deceased. The mummies of dead Egyptians were placed in a sarcophagus which was decorated with a likeness of the deceased and these were interred in tombs. To understand the purpose and the history of Egyptian tombs it is necessary to understand their religion. The Ancient Egyptians believed that preserving the body in death was important to keep their soul alive. In the process of mummification the brain and the internal organs, except the heart, were removed. The Ancient Egyptians believed that a physical body was essential for an eternal life for the deceased. Without a physical body the soul had no place to dwell and became restless forever. They believed that the dead would need to travel through the Underworld which was a land of great dangers. Magic spells were believed to help them through this perilous journey. At the end of the journey the soul of the dead would be judged by the gods where their fate would be decided - either entrance into the perfect afterlife or to be sent to the Devourer of the Dead. The Afterlife was a perfect existence in an ideal version of Egypt. Ancient Egyptians provided for their afterlives according to their earthly means - so their tombs were filled with their best and most expensive belongings. 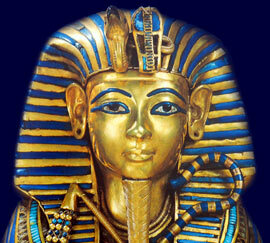 The history of ancient Egyptian tombs changed through the different periods of Egyptian history. The Ancient Egyptian belief in the Afterlife necessitated that their finest and most expensive possessions were buried with them, in their tombs. This fabulous wealth in gold, silver and jewels belonging to the Kings, Queens and nobility naturally attracted the attentions of robber - the tomb raiders. The history of the Royal Egyptian tombs changed according to the different levels of security that were required to keep the tomb raiders at bay, whilst ensuring an easy path to the Afterlife. The history of ancient Egyptian tombs started with the Mastaba. The mastaba was a very simple tomb without any form of decoration. The mastaba was built of mud-brick and consisted of a single elevated platform. The history of Egyptian tombs therefore started with the mastaba which was used during the Pre-dynastic Period (5550 BC - 3050 BC) through to the Early Dynastic Period (3050 BC - 2686 BC). The history of ancient Egyptian tombs made a radical change during the period of the Old Kingdom. In 2686 BC the first Egyptian pyramid was built by Imhotep - the Step Pyramid at Saqqara. The step pyramid was built as a tomb for King Djoser who was one of the kings of the 3rd Dynasty. During the 4th dynasty of the Old Kingdom (2686 BC - 2181 BC) the Great Pyramids of Egypt were built at Giza. Sneferu aka Snefru - 2613-2589, the founder of the fourth dynasty, is known to have commissioned three pyramids and Khufu (Greek Cheops) 2589 - 2566 erected the Great Pyramid of Giza. The First Intermediate Period (2181 BC - 2040 BC) and the 7th - 10th Egyptian Dynasties saw a breakdown of central government. Qakare Ibi is the only Pharaoh that can connected to any tomb monuments. His pyramid has been found at Saqarra and contains pyramid texts on the walls of his tomb. The history of ancient Egyptian tombs came to a halt during the periods of the Middle Kingdom (2040 BC - 1782 BC) and the Second Intermediate Period (1782 BC - 1570 BC) covering the 11th - 17th dynasties. During tses periods the ancient Egyptians waged war on their enemies and the major constructions were temples which were dedicated to their gods. The history of ancient Egyptian tombs saw a dramatic change during the 500 year period of the New Kingdom (1570 BC - 1070 BC) covering the 18th - 20th Egyptian Dynasties. The capital of these Ancient Egyptians was based at Thebes and a necropolis was established in the Valley of the Kings and Queens. These tombs were built into the rock in this remote area. The great Pharaohs who were buried in these rock tombs included Hatshepsut, Tutankhamun, Tuthmose and Ramses II. During the Third Intermediate Period (1070 BC - 525 BC) the Nubians conquer Egypt establishing the 21st - 25th dynasties. The Late Period (672BC - 332 BC) and the 26th - 31st Egyptian Dynasties were ruled by independent princes, Kushite Kings and the Persians. Then during the Third Intermediate Period (1070 BC - 525 BC) the Nubians conquer Egypt establishing the 21st - 25th dynasties. The Late Period (672BC - 332 BC) and the 26th - 31st Egyptian Dynasties were ruled by independent princes, Kushite Kings and the Persians. Then Alexander the Great invades Egypt and establishes the Ptolemaic dynasty 332 BC - 30BC. Finally Egypt becomes a province of the Roman Empire from 30BC - 641 AD. During these dynasties no great tomb monumnets were built but it is interesting to note that the Greeks adopted the Ancient Egyptian religion as did the Romans. The Roman tombs were found in catacombs but prominent Roman tombs containing mummified Romans have been found. The Ancient Egyptian religion finally collapsed when Christianity was imposed on the Egyptian population by the Romans. Each section of the History of Egyptian Tombs addresses all topics and provides interesting facts and information about the Golden Age of Pharaohs and of Egypt. The Sitemap provides full details of all of the information and facts provided about the fascinating subject of the Pharaoh - Tutankhamun and the History of Egyptian Tombs!